1. In the beginning of the book, Maggie has tried to deal with her husband’s death by shrinking “her life to a pinpoint.” She disconnects from people and seems to be trying to make her world and herself smaller and smaller. When you suffered a loss in your life, did you also feel like withdrawing from the world? If you didn’t, how did you feel? And if you did, how did you find your way back? 2. Maggie’s trip to China is weighted with deep emotions — confusion over her late husband’s possible betrayal of her, nostalgia for the time they spent in Beijing, shock, grief. What does she ultimately find therapeutic about her time there? Do you think people are generally more open to enlightening experiences when they travel? If so, how or why? 3. Maggie approaches China, especially Chinese cuisine, with an initial reluctance. What is it about the culture and the food in Beijing that helps to win her over? What connections does Maggie find between this new world of cuisine and her writing specialty, American regional cuisine? 4. 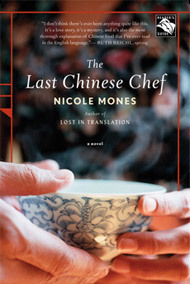 The Last Chinese Chef could be described as a novel about human healing through the lessons and joys of cuisine and the bonds between people. Several readers have written to say they felt a healing echo in themselves from reading the novel. Did you sense any of this yourself? How did the book affect you? 5. As the book illuminates China’s gastronomical philosophy, we learn that Chinese cuisine is not only about fine ingredients and unique skills; it is also about guanxi, or relationship. Is guanxi a concept that is solely Chinese, or do other cultures honor connections and relationships in the same way — through food? What does Chinese food teach Maggie about guanxi? What did you learn that might change the way you dine and eat? 6. Of all the chefs vying for a spot in the Chinese Cultural Olympics, it could be said that Sam — raised in America, the son of an American Jewish mother and an expatriate Chinese father — is the least “Chinese.” Yet his food is described as the most traditional. Why is it important to Sam to honor the traditions of his father and grandfather before him? What do his culinary interests reveal about him and his mixed heritage? 7. Sam hones his culinary skills under the tutelage of his three “uncles.” How do these men influence Sam’s cooking, and in what way does he work their instructions into his own culinary vision? In your own life, who has most influenced or encouraged your interest in food and/or traditions? 8. Sam’s relationship with his father is complex and strained at times. Why has the elder Liang made the choices he has, and how have his choices contributed to the relationship with his son? Do you empathize with his decisions? 9. What is the significance of the book-within-the-novel, Sam’s grandfather’s work, The Last Chinese Chef? What deeper cultural understanding do the translated excerpts offer to Maggie, and to you as a reader? 10. Her interview assignment starts as a side note to her main reason for coming to China: investigation into the claim against her husband’s estate. How does her unexpected assignment end up changing how she feels about her husband’s death? How does her meeting with the claimants serve as a breakthrough for her? How did you feel about her ultimate handling of the claim? What does the experience teach her about herself? 11. When Maggie first learns about Gao Lan she is not disposed to feel friendly, yet as she gets to know the full story — slowly — her perspective on Gao Lan changes. Do you sympathize with the shift in Maggie’s attitude toward this woman? Has this ever happened to you? Have you ever started out against someone and then, as you got to know more about them, slowly changed your view? 12. Readers have written to Nicole Mones to note that there are no villains in the book. The people who seem to have done wrong to Maggie in the beginning (like Matt and Gao Lan) become just human people who have made mistakes by the end. One reader wrote that she felt there were only two “villains” in the book: the system and the obstacles we place in front of ourselves. In your personal life story, what are your “villains,” in other words, what forces or systems feel to you like they are most against you? What do you do about them? 13. Reviewers have described this book as “tantalizing,” “mouthwatering,” “delicious.” What about Mones’ descriptions make them so tempting? Was there a particular food scene that you found especially memorable or mouthwatering? 14. How has Maggie’s experience in Beijing altered her by the book’s end? What kind of future do you imagine for her, for Sam? 15. Maggie finds her way back through grief by way of a cuisine that insists people be bonded together, over and over, at every meal. How does food and all that it represents — community, nourishment, connection with the past — serve as a balm in both Maggie’s life and Sam’s life? When have you been similarly affected by the way you eat? When you finished the book, did you feel at all differently about how you cook and eat with others in your own life? If you felt you would like to change one thing about this aspect of your life, what would it be? Could you do it? Why or why not? Your novel comes to life against the unusual background of serious Chinese cuisine. Why did you choose this setting? Because there is a magnificent world of Chinese food that remains invisible to most Americans. What we call Chinese food in this country is a hybrid cuisine, different and limited, so most Americans have never experienced true Chinese food — even though it is beginning to be available in this country and can usually be found in U.S. cities with strong Chinese communities. When did you become interested in Chinese food? From the moment I arrived there in 1977, to do business in textiles. You can imagine what a shock it was to sit down to my first banquet in the People’s Republic. I had never dreamed such dishes existed. In the eighteen years I did business in China, I came to see that the cuisine itself constituted a kind of language. Formal meals sent signals without words. Often in those years I would hear foreign businessmen complain that they had sat through a three-hour banquet only to have every attempt to discuss business rebuffed. They did not understand that the banquet itself was the conversation. Was there much of a restaurant scene then? No. In the early fifties, the government allowed only a few restaurants to stay open; they shuttered the rest. By the nineties, that had changed. Privatization arrived and the restaurant industry was one of the first to bloom. You might say that food, formerly reviled as decadent, was one of the first of life’s pleasures to be rehabilitated in the new free-market China. Now it’s really big. There’s keen competition to create great cuisine. It’s a boom time for the art form. The Cultural Revolution had just been formally ended by the National People’s Congress six weeks before. We had no diplomatic relations. To enter China, you had to go to a rural border village north of Hong Kong and cross on foot. British authorities would exit-stamp you to walk across a covered wooden bridge with your suitcase. I remember being surprised that I made it across without fainting. It was very surreal. At that time China was premodern; to enter it was to fall back in time to the 1940s. And people were completely traumatized by the Cultural Revolution and the famine that had preceded it. A few years later, just as I was gaining the ability to converse in Chinese, the curtain of silence was starting to lift on recent traumas such as the Cultural Revolution. I found Chinese people everywhere filled with the need to tell their stories. In those years I absorbed countless tales of people’s lives. This prepared me to write novels with Chinese characters. What were the three most fascinating things you learned about Chinese cuisine? First, to a much greater degree than other cuisines, Chinese food consciously seeks to reflect and comment on its culture through a web of references and allusions. It encompasses a world, and maybe that’s why it’s seen there as a fine art form. Second, Chinese food aims to engage the mind, not just the palate. There is a whole tradition of artifice — dishes come to the table looking like one thing but turn out to be something else. Other dishes call up events in history or great works of art. Still others aim to spur the creation of poetry at the table. Third, the highest lesson of Chinese food, its single most important aspect, is the focus on community. All food in China is shared. Nothing is every plated for the individual — the opposite of cuisine in the West. Through the ritual of eating together every day, the human bonds that hold the world together are forged and reinforced. That’s the journey at the heart of The Last Chinese Chef.